The Zeta LT delivers weather protection during extended trekking and backpacking trips. Lightweight, comfortable and compressible, it is made from N40p-X 3L Gore-Tex fabric with Gore C-Knit™ backer technology. This material delivers longwearing waterproof, windproof, highly breathable performance with a backer technology that makes the fabric exceptionally supple, quiet and comfortable next to the skin. The Arc’teryx Trim fit keeps the shell close to the body to improve the fabric breathability, but leaves room for light layers. Articulation in the sleeves and gusseted underarms provide freedom of movement. The jacket works in tandem with the Zeta LT pant for complete weather protection. * Gore-Tex® with C-Knit backer technology is more sensitive to snagging and staining. After washing, please dry immediately. 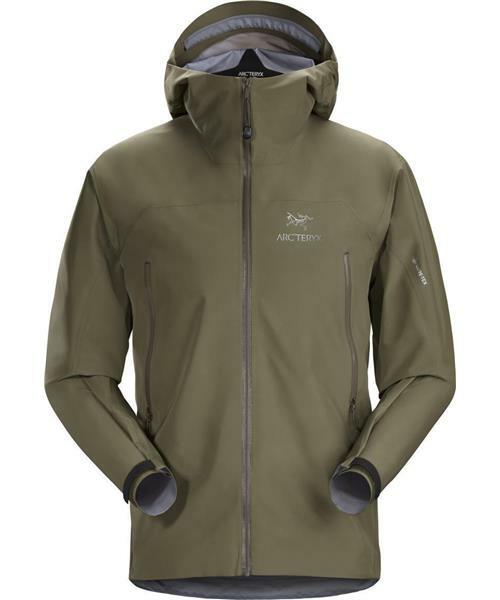 * Note: Arcteryx WaterTight™ zippers are highly water resistant, but not waterproof. They do not recommend keeping items in your pockets that may be damaged by moisture. Zeta LT Jacket - Mens is rated 5.0 out of 5 by 2. Rated 5 out of 5 by GMAC from Practical lightweight all-rounder I have an Alpha SV that I use on a regular basis which has proven to be solidly reliable for a couple of years, but I felt I needed a lightweight (and especially packable) jacket for less rigorous use. The Zeta LT rolls up nicely into the hood for packing away and so far has proven to be capable in windy and wet weather. The cut is similar to the Alpha, but feels slightly longer in the arms and overall length. It's a lot lighter and though I wouldn't use it in the same conditions as the Alpha it handles itself well in a downpour. Overall, this works well as an everyday urban waterproof or a trail/hiking jacket. Rated 5 out of 5 by Coastalbp from Great Lite weight spring, summer, fall waterproof shell I purchased the zeta lt to meet my hard shell needs for late spring, summer and early fall. Switching from s sleeve, lg sleeve and light mid layer covers those temps. This is a great waterproof, wind proof shell. I am 6 ft 1", 195 lbs and the large is a good fit. The hood stows very nicely in the collar, unlike other jackets I have had. The pit zips are useful in warmer temps to help regulate my body temp. I highly recommend this jacket.